THUMBS UP TO… riding to the rescue. After scheduling conflicts scuttled a plan for a ninth annual full-scale WilleyWorld Community Productions show in conjunction with Ottawa Riverfest, it looked for a few days as if the streak might be broken. 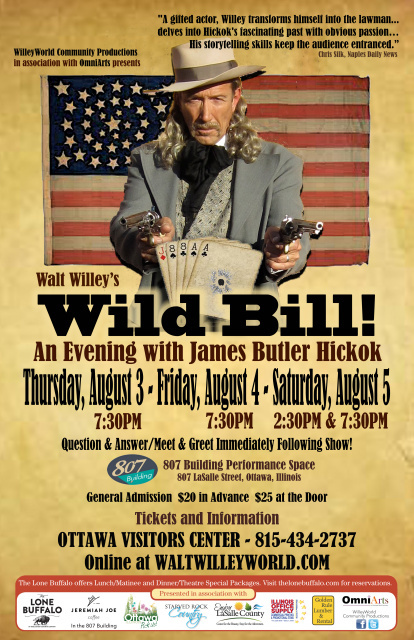 However, that will not be the case as Walt Willey will command the stage himself, mounting a new version of his 2012 one-man show “Wild Bill: An Evening With James Butler Hickok” the first weekend of August. The veteran actor and Ottawa native wrote the show with lifelong friend Kim “Howard” Johnson, another big name in the local arts community. Willey has done about 40 performances since the debut at Mendota High School, but this will be the first since March 2016 in Pontiac. This is a great fallback option for Riverfest patrons who now consider live theater an essential component of the celebration, and we look forward to seeing what the 10th annual production delivers in 2018.